It becomes a new challenge for organization to make sense of the millions of log lines. In addition, log management became more critical to monitor system and application performance and security risk. On the other hand, log management may be very time consuming with traditional methods. If you need Enterprise solution, there are too many options that you can integrate to your platform. Please check this link for more information. 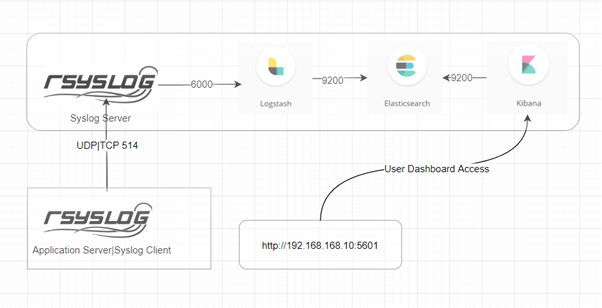 Open-Source software Rsyslog, Elasticsearch, Logstash and Kibana provide same functions that you can transport, transmit, store and visualize systems and application logs. We will perform ELK installation on Syslog Server. But you should check your configuration if you plan to deploy installation on production. You may separate syslog server and elk server on production. Before start installation, you need to download binaries from this link. When you click download button then you need to select your Linux base binary file. For Debian base Linux server choose DEB file. Centos, Fedora, RHEL use RPM base package. You can perform default installation steps for Kibana and logstash. Download binaries from this link then use “rpm” for fedora base and “dpkg” for debian base command to install application. I added simple base configuration for Kibana and logstash. You should check manual page to find out which attributes you need and how to use. Server Host: Define host information to open sockets. You should define your ELK server ip address. Elastichsearch URL: Define your elastichsearch server’s ip address and port. I did not change any configuration on logstash YML file. We only need to define our logstash log format to manage apache and syslog logs. I added an example of logstash configuration for Apache logs and syslogs. After define configuration you should restart logstash. Logstash will be open TCP 6000 port and capture incoming logs. Then it will forward the formatted logs to elastichsarch. This package must be installed on your server. Please check if you have already installed rsyslog package to your system both client and server. After package installation then define a module which redirect all incoming logs to the logstash deamon. At this example, we used local6 to redirect the output of application logs on client site. We perform installation ELK and rsyslog server at the same machine. Therefore, we defined “127.0.0.1”. First, create rsyslogd modules to collect application logs. Last step, define rsyslog server to send application logs. After follow installation steps, open up Kibana in browser with “http://<kibana_Ip_address>:5601” . You will be presented with the Kibana home page. From management tab you will be able to manage your Elasticsearch indices. © 2019 Linux/Unix Support. All Rights Reserved.